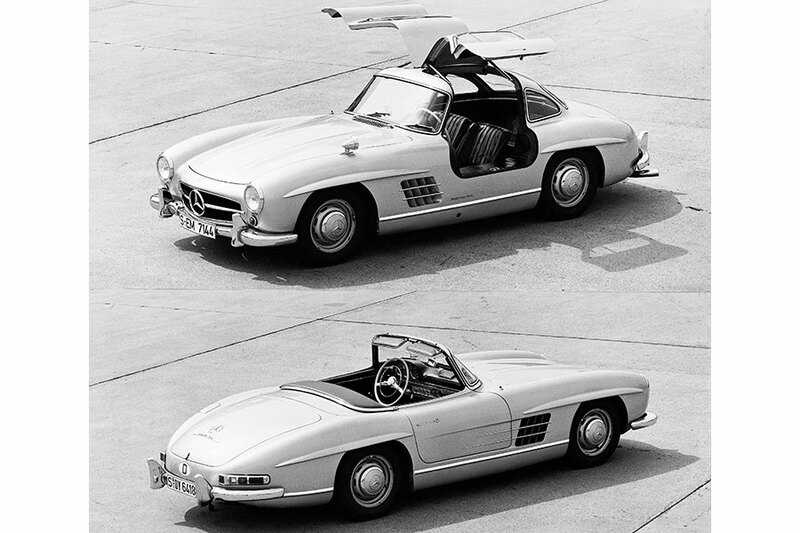 The roadster version (W 198 II series) of the Mercedes-Benz 300 SL gullwing was introduced by Daimler-Benz at the March 14 – 24, 1957 Geneva Motor Show Daimler-Benz. The car was the company’s answer to the demand for a high-performance open-top sports car. 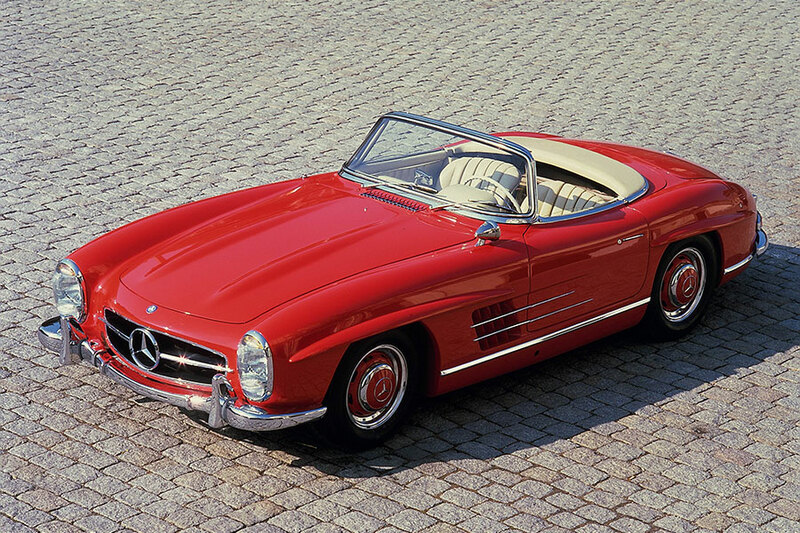 The roadster succeeded the 300 SL coupe built from 1954 to 1957. Compared with its predecessor, the roadster had a slightly modified front end and vertically arranged headlamp lenses. It also boasted improved running gear, the most significant design difference being a modification to the coupe space frame which allowed lower entry sills for easier access to the roadster and doors hinged at the front. These changes also made it possible to accommodate the easy-to-open soft-top roof. 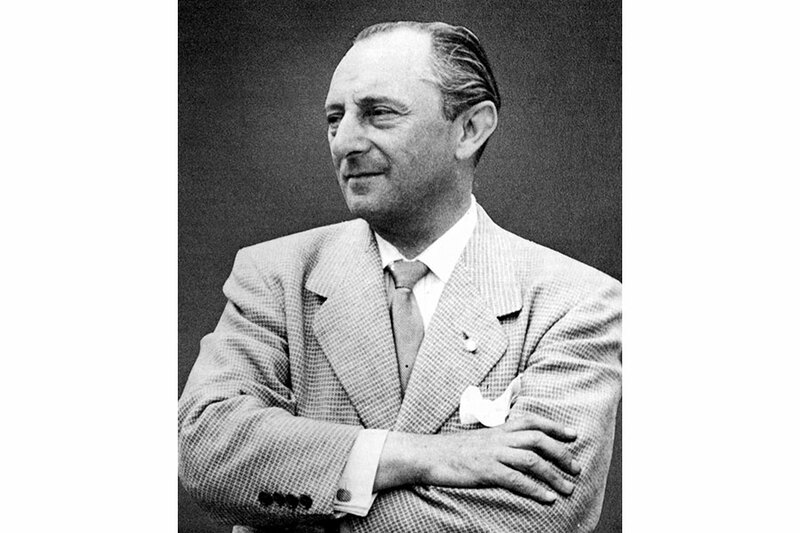 The idea to replace the Gullwing with a roadster came from Maximilian “Max” Hoffman. An Austrian by birth, Hoffmann had been importing Mercedes-Benz vehicles to the United States of America since 1952 and was the principal driving force behind the initiative to develop the 300 SL racing sports car (W 194) into a production coupe. In order to realize this goal Rudolf Uhlenhaut returned to the space frame and technology of an abandoned racing prototype from 1953. Karl Wilfert and Friedrich Geiger developed the racing prototype into a production model. The six-cylinder in-line M 198 engine that powered the racing sports car now became the basis for a three-liter six-cylinder in-line unit for the series SL. It was the first four-stroke production engine at all to feature direct gasoline injection. The addition of direct injection boosted engine performance to 215 hp (158 kW), a sizeable increase compared with the 175 hp/129 kW produced by the naturally-aspirated W 194 engine with three downdraft carburetors. Hoffman had already persuaded the Stuttgart development department to use the Mercedes-Benz 180 as the basis for the 190 SL roadster (W 121), the car that made its debut in 1955. By 1957 the importer was keen to translate the success of this elegant open-top tourer on the North American market to the larger and more powerful 300 SL. He lobbied vociferously in Stuttgart to have Mercedes-Benz develop a roadster out of the Gullwing. 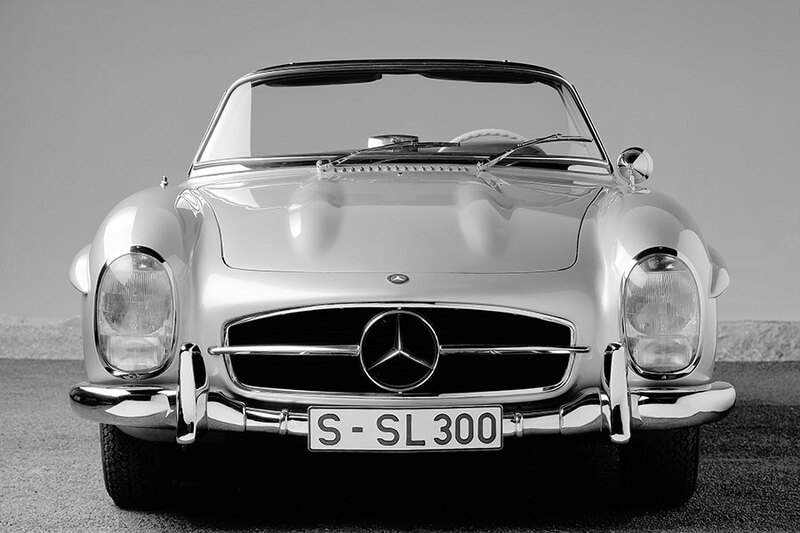 Launched by Daimler-Benz in 1954, the Mercedes-Benz 300 SL was a breathtaking sports car, and one which continued in the tradition established by members of the legendary S to SSKL families. Given the history of the brand, it seemed only logical to turn this vehicle into a classic roadster version for the road. In addition, it would mean the elegant entrance onto the automotive scene of an open-top sports car that embodied the fascinating blend of dynamically flowing lines and top sports appeal. The success of the roadster, of which 1,858 units were built between 1957 and 1963, was confirmation of the decision taken by Maxie Hoffman and the Mercedes-Benz developers. The Mercedes-Benz 300 SL roadster successfully reinterpreted brand history based on the company’s most recent motor sport triumphs. At the same time, the concept of a powerful and elegant open-top sports car became firmly established as the leitmotif of the SL-Class. In 1957, however, many fans of the coupe were saddened to see the departure of this extraordinary sports car with its distinctive upward-swinging doors. The enormous fascination the car had inspired was expressed in the familiar names people had spontaneously given it. 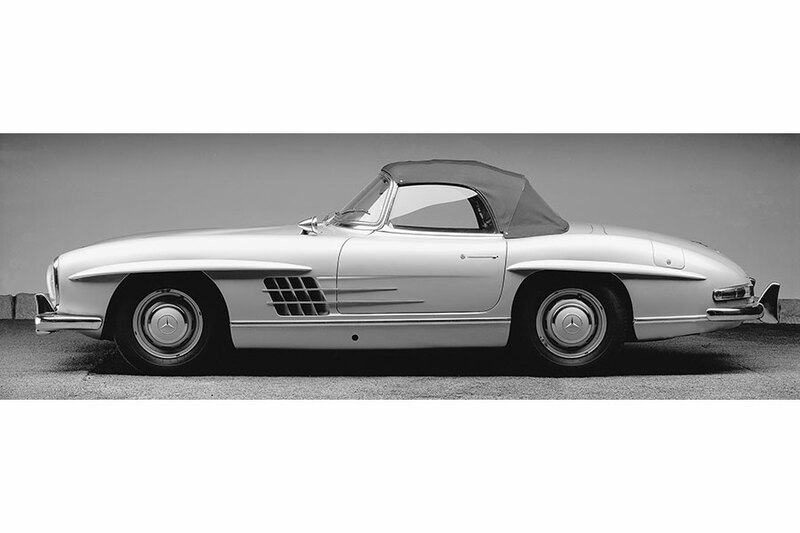 When the sports car was premiered at the International Motor Sports Show in New York in 1954, the North American public christened it the Gullwing. And French fans of the streamlined coupe, similarly inspired by the upward-swinging doors, named it Papillon (“butterfly”). But the unique door solution was anything but a flash of inspiration on the part of the developers designed to give the sports car the edge over the competition even at standstill. Quite the contrary. The roof-mounted, upward-swinging doors were very much an integral and necessary part of the overall concept, since the highly robust, lightweight space frame designed by Rudolf Uhlenhaut in 1952 for the racing sports version of the 300 SL left no room for conventional doors. In fact, in prototype versions of the racing sports car the upper edges of the cross members were so high that the upward-swinging doors ended at the lower edge of the side windows. Not until the long-distance race at Le Mans in June 1952 did Uhlenhaut give the doors a slightly fuller length. This design was then the version that found its way into the racing sports prototype of 1953 and ultimately also the W 198 I, which went into production as a series sports car in 1954. The idea that the 300 SL was also conceivable as a vehicle without roof and gullwing doors had been demonstrated by Uhlenhaut as early as 1952. For the Sports Car Anniversary Grand Prix on the Nürburgring that year, he developed four roadsters based on the W 194. They were 100 kilograms lighter than the coupe but retained an identical space frame. So rather than conventional doors, the open-topped cars had half-length ‘flaps’ that swung upwards and outwards towards the engine hood. 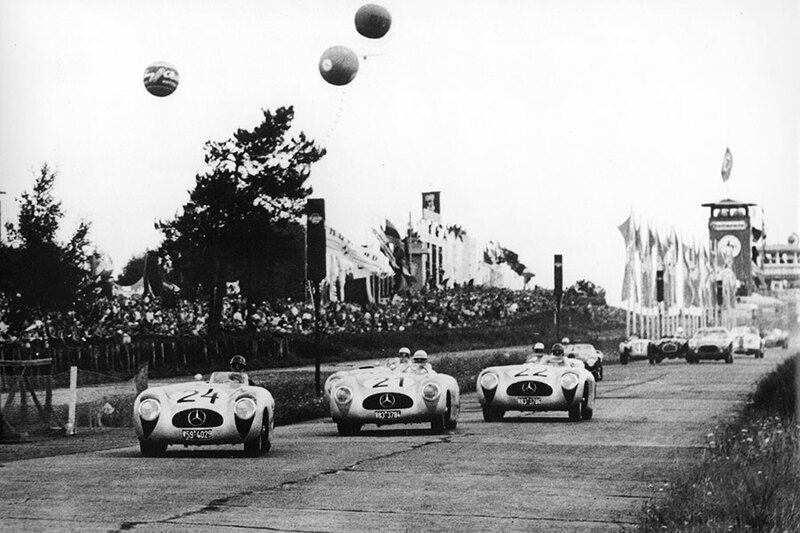 In the race itself, held on the Nürburgring as part of the program for the German Grand Prix on August 3, 1952, the Mercedes-Benz race department notched up a quadruple victory, with Hermann Lang finishing ahead of Karl Kling, Fritz Rieß and Theo Helfrich. 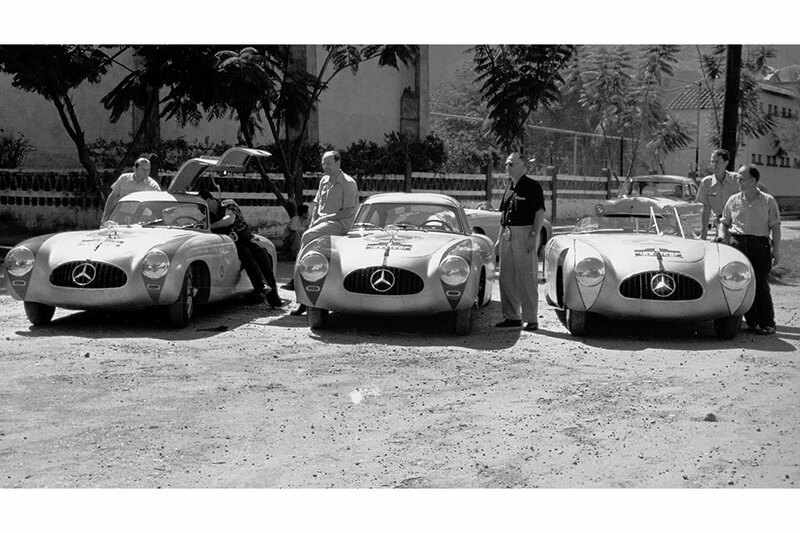 Mercedes-Benz also entered two of the open-top racing sports cars for the Carrera Panamericana. Only one of the 300 SL racing roadsters started the race, however, driven by John Cooper Fitch and Eugen Geiger. The second car was piloted from stage to stage by the newsman Günther Molter. The race was won by the two coupes of Karl Kling/ Hans Klenk and Hermann Lang/Erwin Grupp. Fitch on the other hand was disqualified for an infringement of the rules, having returned to have minor adjustments made to his car during one stage after already crossing the starting line. The racing team in the Carrera Panamericana Mexico, 1952. (From left): Hermann Lang, Erwin Grupp, Hans Klenk and Karl Kling standing next to the Mercedes-Benz 300 SL coupe (W 194) and John Fitch and Eugen Geiger alongside the 300 SL roadster (W 194). The cut-down doors proved a workable solution for racing. But it was decided the W198 II was to have conventional front-mounted doors. That meant the engineers had to make significant alterations to the space frame and create lower entrance sills on either side. Additional tubing had to be added in order to maintain the rigidity of the frame’s design. 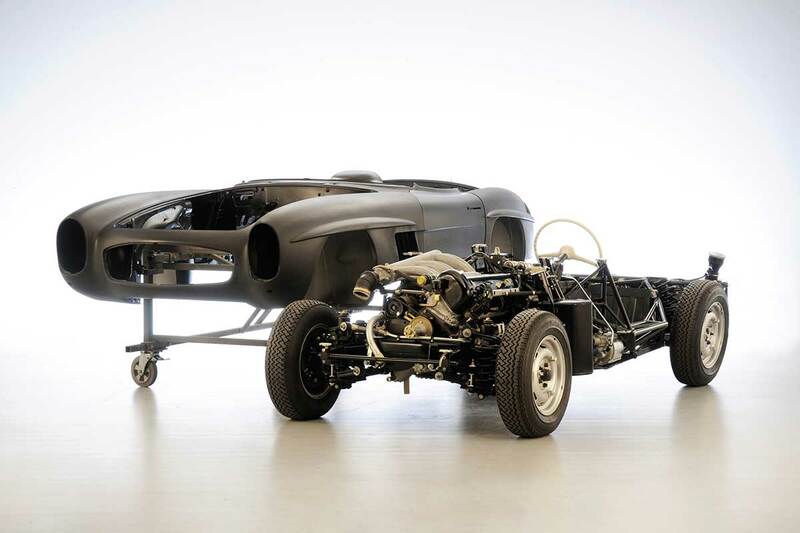 It left the roadster weighing 35 kilograms more than the coupe, bringing its total weight to 1,330 kilograms. And when Mercedes-Benz introduced the new hardtop in 1958, the 300 SL roadster outweighed the coupe by as much as 75 kilograms. Unsurprisingly, top speed fell from 260 km/h to 250 km/h as a result. So it was not long before fans of the coupe began making less than favorable comments about the roadster’s softer features, even going so far as to label it a “living room on wheels.” That aside, the 300 SL was without question an outstanding super-sports car for its day. Easier access, the omission of a fold-away steering wheel and the addition of wind-down windows for ventilation when driving with the hardtop in place meant that the 300 SL roadster was a much more civilized vehicle for everyday use. Handling was greatly improved when the 300 SL roadster was equipped with a low-pivot single-joint swing axle at the rear. At high-speeds in particular the coupe’s dual-joint swing axle could often prove a handful even with an expert at the wheel. Mercedes-Benz had already fitted this same single-joint axle featuring an equalizer spring to a 220 a (W 180) model.